bride.ca | Video Booths: the new Wedding Reception Must-Have! "Video booths have been gaining in popularity over the last couple of years. They are functional and offer an added element of entertainment to your reception. They are fast becoming a wedding must-have.".. Capturing your wedding on video has been and continues to be an excellent way to relive all your special wedding day moments. But nowadays couples are taking the video concept one step further, into the realm of "reality-TV", by adding video booths to their reception. These booths range in size and options but generally, they are placed at the reception for guests to visit any time during the event to record messages, stories, and thoughts for you in a candid yet fun and unstructured manner. These messages can later be converted into a DVD, or incorporated into your wedding video for you to enjoy long after the wedding. And, of course, this new spin is sure to keep your guests entertained throughout the night. 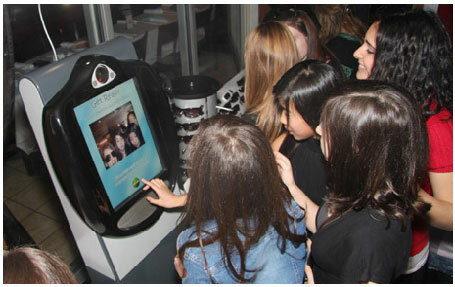 Guest Moments Video Kiosks, in Toronto, also offer a webpage, complete with thank-you e-mails to the participating guests. The thank-you email directs your guests to the webpage so that they, too, can see the video that they helped create for you. Also in Toronto, we have Soapbox: they actually carry photo booths too. Too, their video booths have an "open concept design" so that your guests are filmed "using your event as the backdrop". What we need now is someone to provide this service everywhere else! Vancouver, Calgary, Montreal... lots of photo-booths available to rent there.. no video-booths yet. Check out our event rentals and unique services listings.. perhaps some of those photo-booth companies are adding video to the menu..
if there is no local video booth rental in your area? They chose a spot at their venue to set up a backdrop, equipped it with a tripod and camera, added some props and let their guests play while creating special messages for the bride and groom. Now, that's not only creative and cheap but also extra fun and entertaining for all!!! Ensure you can have the booth for the duration of the reception. If there is a time restriction, ask about having it for an extended period and discuss added costs. Confirm with your vendor where the booth is to be placed at the venue. Make sure it's in an accessible and visible part of the facility. When planning your wedding, remember that your guests are also out for a special night. Make the most of the tools you have at hand and create an atmosphere where they will feel comfortable, relaxed and above all, entertained. Video booths fit the bill where all of these elements are concerned. Enjoy!